TRINITY AUTO ENGINEERING PVT LTD is an ISO 9001-2008 certified company committed to offer top quality silent block bushes, rubber mountings, suspension bushes, and all other automobile rubber products, auto rubber parts & automotive rubber products. We are known to be a leading manufacturer and supplier catering to the demands of various sectors/ applications such as automotive, railway vehicle industry, aircraft industry, general engine & machine builders. Our company specializes in manufacturing superior quality automobile rubber parts and different types of rubber products in custom made designs as per the specific requirements of the buyers. We got established in the year 1992, with our operating base in VASAI EAST near MUMBAI (INDIA). The company was founded by Mr. Anil Ambardekar (Director). Within a short span of time, we became the most preferred choice of buyers for quality AUTOMOBILE RUBBER COMPONENTS and RUBBER PARTS. The comprehensive range offered by us comprises silent block bushes, anti vibration mounts, rubber mounts, suspension bushes, engine mountings, O rings, car suspension bush, rubber mountings, and more. These are widely used in all types of automobiles. 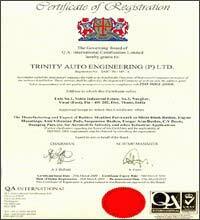 TRINITY AUTO ENGINEERING PVT LTD has emerged as a global player with a wide customer base across the world. Factors like efficient production facilities, quality oriented work flow, stringent process control, and reliable/ prompt services have immensely contributed to company’s growth & success. Our application oriented product serves the requirements of various industrial segments. As a trusted manufacturer, we make sure to utilize fine grade materials and cutting edge technologies. We have reached to newer heights of success in the domain by consistently catering to the rising demands for automobile rubber products. Besides offering quality tested automotive rubber products in the domestic market, we are also exporting bulk quantities of auto rubber parts to all major countries and worldwide markets. We are primarily engaged in manufacturing all types of auto rubber parts, like rubber bushes, silent block bushes, silent blocs, silentbloc bush, rubber mountings, rubber grommets, rubber to metal bonded bushes, anti vibration mountings, rubber mounts, vibration mountings, suspension mounts, engine mountings, cushion foot mountings, O rings, oil seals and various other rubber products for automobile indsutry. In addition, we have also firmly established ourselves as a leading manufacturer and supplier of a wide variety of anti vibration mountings used in automobiles as well as several other industries. We have been engaged in the manufacturing of automobile rubber parts since 1991 and have always been adopting stringent quality control policy in our process of production to keep our customer completely satisfied. Under our products quality assurance scheme, each and every manufactured product is sent for multistage quality testing, which starts from sourcing of raw materials and continues till final delivery. We have a highly advanced manufacturing facilities, which are ideal for producing superior quality rubber products. We manufacture and export varieties of other moulded rubber products for other uses in different types of vehicles, like rubber rollers, metal to rubber bonded items, rubber pads, rubber moulds, rubber metal bonded seals, rubber sheets, rubber bumbers, rubber gaskets, rubber grommets, rubber packings, rubber sleeves, rubber rolls, rubber diaghpragms, rubber washers, and other rubber parts for various other uses in automobiles. These automobile rubber parts and products are highly durable and a masterpiece of engineering. Our all rubber products are highly reliable and are known for their quality and high performance. Additionally, customers are eased with the availability of the customized automotive rubber products as per the specifications and drawings provided by them. Also visit us on G+.